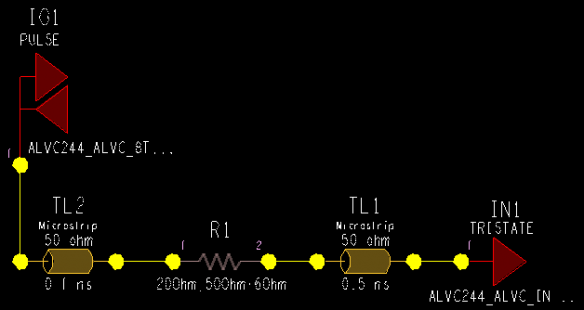 As part of a series of real life simulations on a very simple part of a circuit I try to figure out just how useful Altium’s built-in signal integrity tool really is. The price is right, but is it up to the job? Last time I looked at input voltage waveforms and realized we needed a termination scheme to connect a 74ALCV244 output to just a single input. 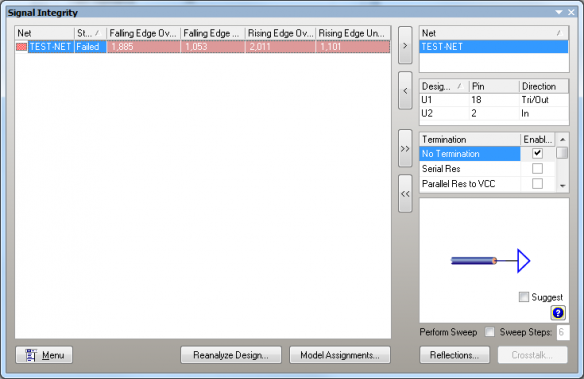 So let’s look at how that simulation unfolds in Altium and Cadence, starting with the Cadence tool. First the schematic needs a slight update to include a series resistor and a bit of transmission line from the driver to the resistor (so the overall length just increased from 0.5ns to 0.6 ns, which does not really matter). Normally I would want to select the trace that looks best, with a tendency to overshoot. But not too much as I still want to make sure we don’t exceed the negative input max voltage spec in the FAST case. This is based on the assumption that we are using this fairly fast device because we want to go fast. Not always is this the case, so if the device is fast but really don’t need to be, I would just make sure we don’t have too much overshoot. The 38R value is emphasized a bit as it looks like it’s about at the optimum – maybe the 32R trace is fine too, but with a bit more overshoot. In reality we could end up with 33R or 39R if going by E24 standard values. 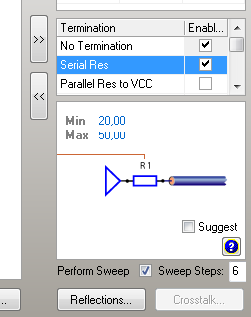 In the same simulation setup dialog box I simply click on the serial termination resistor check box and the sweep check box. Enter a few parameters and get the tool to do the sweep. It is clear from the curves that the two tools arrive at quite different results for this sweep. And for a reason. 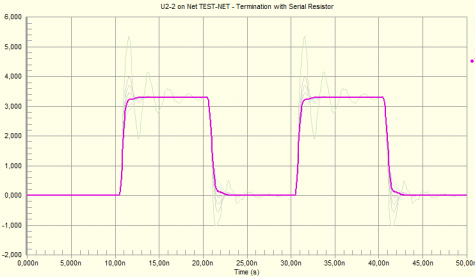 In the Cadence curves we have a non-zero delay from the output of the ’244 to the series termination resistor. 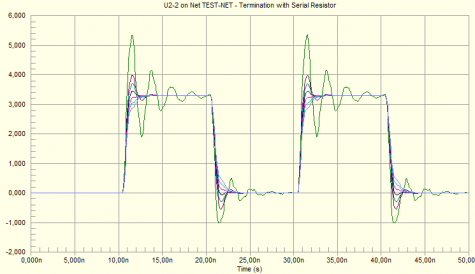 The Altium trick puts the series resistor right at the ‘244 output with zero delay. This is not realistic in practice – and as can be seen from the curves this is actually quite significant. This can look a bit crowded, so I repeat the screenshot here with the 38R trace highlighted. The green (TYP) curve is what we could (roughly) compare to the Altium curve – with the before mentioned difference in simulation setup in mind. If we go by the Altium simulation we would be okay – and the waveform looks very nice. I am to lazy to bother re-importing the IBIS files to check the two other process corners (FAST and SLOW), but I will have to check this before the final solution is found. If we go by the Cadence simulation we would also be okay, but the FAST curve is below -0.5V. 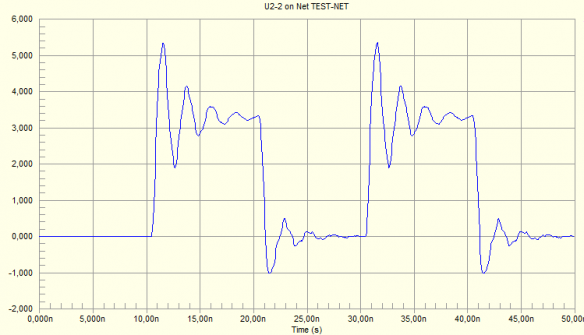 Good thing I was able to check the input current using Cadence (see last post). 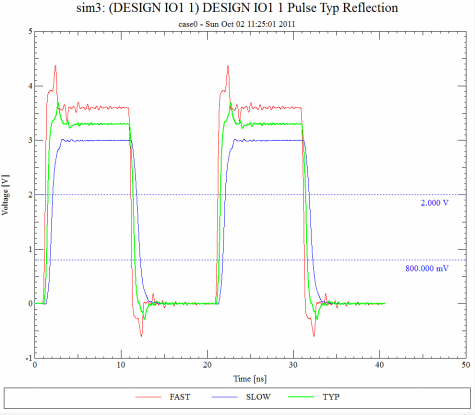 Finding a good series termination resistor value is faster and easier in Altium, but the more detailed analysis taking the trace from output to resistor into consideration is much more difficult in Altium. Having to re-import the IBIS model 3 times to check the FAST/TYP/SLOW process corners is just plain annoying – and I bet many designers will skip that and thus not fully realize what’s going on with the signals over voltage and temperature. Find the other parts of this series here: Part I and Part II. Q: What do you think? Would you be happy to always re-import your IBIS files 3 times if that was the only annoyance of a much cheaper tool? In part I of this series of comparisons I started my quest to figure out if Altium is any good for SI analysis. It’s clearly one of the cheapest tools out there that allows you to do IBIS model based simulations. Forgetting the price, can it get the job done? Last time I did a very simple reflection analysis of one 74ALVC244 (tri-statable) output driving an input of the same type device. Now it’s maybe time to look at the results and see if we really need termination resistors for this. Let’s repeat the input voltage waveform from the simulator. Here showing the results from Cadence, but the Altium curves were very similar. 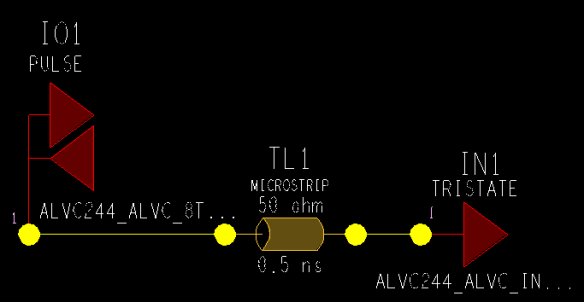 Looking at the waveform it becomes clear that a termination resistor could make this look a lot nicer. But is it really needed? Let’s look at the datasheet. 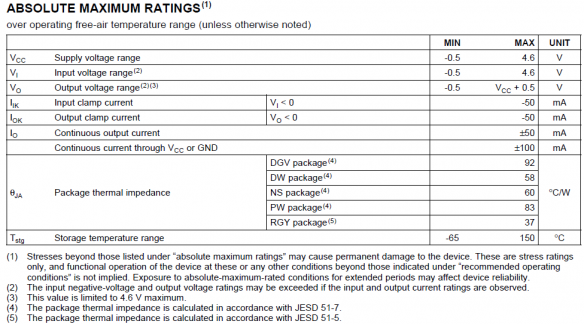 The Vi input voltage range is -0.5V to 4.6V. Looking at the simulated curve that seems to be exceeded a bit in the low end with the input voltage going down to -0.7V with the input diode clearly clamping. But look at the note (2) allowing this, provided the clamp current is within the listed limits. So in order to asses this we should really be simulating the current flowing into the input. How can we do this in Altium? Honnestly I have no clue how or if this is possible. Do you have any idea how to do this? Please let me know. Now this was a lot of work on the low state – how about the high state? The upper input voltage limit from the absolute maximum rating section of the datasheet of 4.6V also seem to be exceeded quite a bit for both the TYP and FAST corner. So right there I know that there is really no way around finding a good termination scheme. 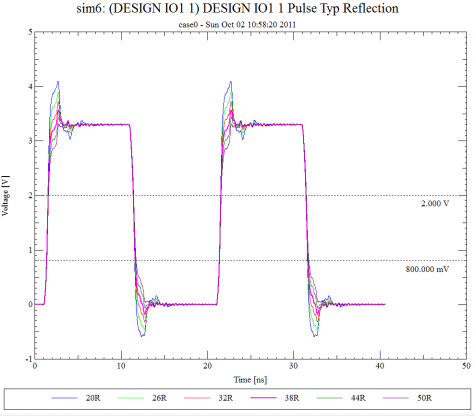 Simulations to observe input current does not seem to be possible with Altium. For that you need a better tool. Watch this space as the story continues in part III. Q: How do you simulate the input current in Altium like shown for Cadence? Or is this completely irrelevant for you? Is Altium any good for signal integrity simulations? A question I get asked a lot. 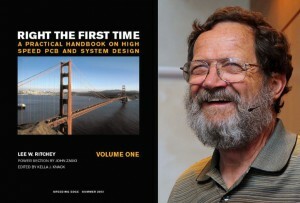 The price is right – you basically get the SI simulator for free as part of the schematic/layout/mechanical etc. package. With cheap comes natural skepticism. We are used to fairly expensive dedicated SI tools from the big players like Hyperlynx from Mentor and SigExplorer from Cadence. 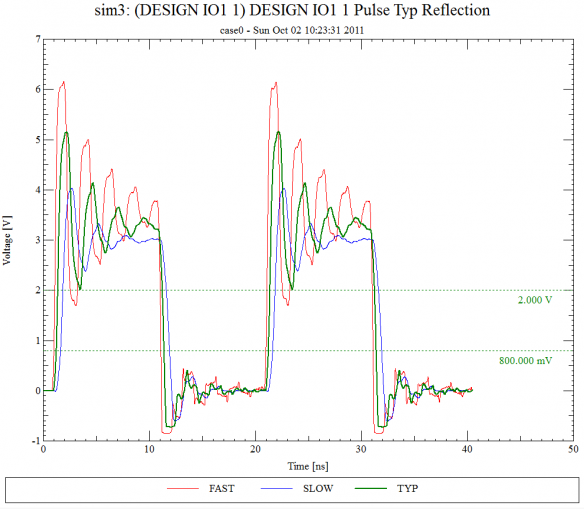 So just how well does this cheap simulator in Altium Designer handle realistic simulations? I decided to do a few comparisons to test out the Altium Signal Integrity simulator. This is Part I of that test. For this test I picked a simple analysis of one 74ALVC244 output (can be tri-stated, but I want to look at the output enabled case only) driving one of the inputs. All operating off a 3.3V supply. And yes this is a very simple analysis – but also very similar to what you would do with the latest DDR memory device or whatever is hot for you right now. My initial thinking is: “This is a fast device, but is it fast enough to require a series termination resistor?” and “What would the ideal series termination resistor value be?”. Both questions needs a quick and decent but not obsessively accurate answer. Cadence calls their tool SigExplorer in OrCAD PCB SI (we are on version 16.5 here). The sketch for the analysis is set up like this with the I/O driving a pulse into a transmission line (ideal 0.5ns, 50R) to the input. Note: You can click all images to have them blown up in a more readable size. Altium Designer is different. 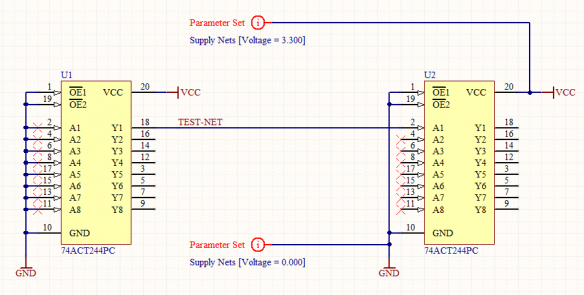 In Altium you have to draw this with the actual schematic symbols and as a minimum connect power and ground with special net information parameter set symbols. Models from the IBIS file are loaded and attached under the schematic library symbol. In this process I select the TYP models, as Altium unfortunately requires you to select the process corner when the IBIS file is imported – more on this annoyance later. This is obviously less flexible, but sufficient for this simple analysis. It’s pretty obvious that the input diode is clipping the waveform in the low state, maybe that puts too much current through that diode. I may want to check that later. Also there is a lot of overshoot for both rising and falling edges. Maybe that’s bad as well. 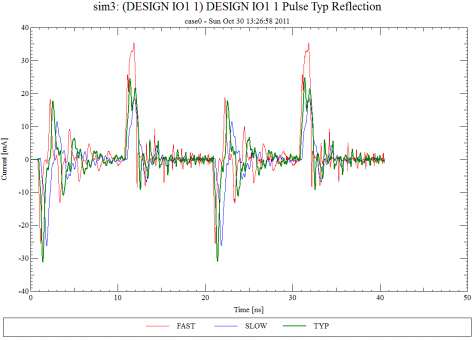 We look at that later – now let us try Altium and see how the simulations look in that tool. 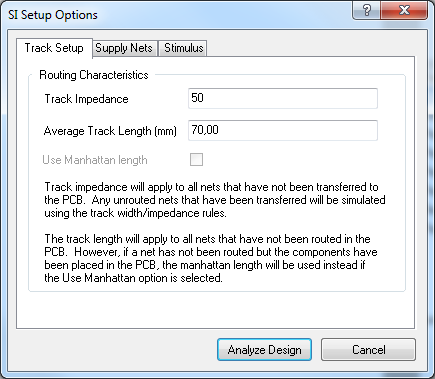 For a similar analysis and easy compare to the earlier Cadence analysis, I had all unrouted transmission line impedance’s set to 50R and the length of the transmission line set at about 0.5ns or 70mm (yes, you can use mils too). Then I press the button and get the result dialog box. At this point it’s obvious that Altium thinks this is no good – but I want to make my own judgement by looking at the reflection waveforms. This is set up to make comparison to the simulation with Cadence easy. If you want to compare with the previous simulation on Cadence, this should be compared to the TYP curve (shown in green). They are clearly not identical, but close enough. The overshoot I worry about on both falling and rising edges come out pretty much the same on both tools. Just using the Altium tool I still have no idea how crazy this device gets at the process corners. I could import the IBIS models again this time selecting either SLOW or FAST and repeat the above, but that’s a bit too cumbersome for me so I cross my fingers and promise myself to do that check later in the process. For a simple analysis like this – so far Altium is up to the job. The simulation results are comparable. The UI is clearly different and less flexible in Altium, but not to a point that really matters. Watch this space as the story continues in part II. Q: Would SI simulations like this one require you to use the full actual part symbols in your ideal tool?